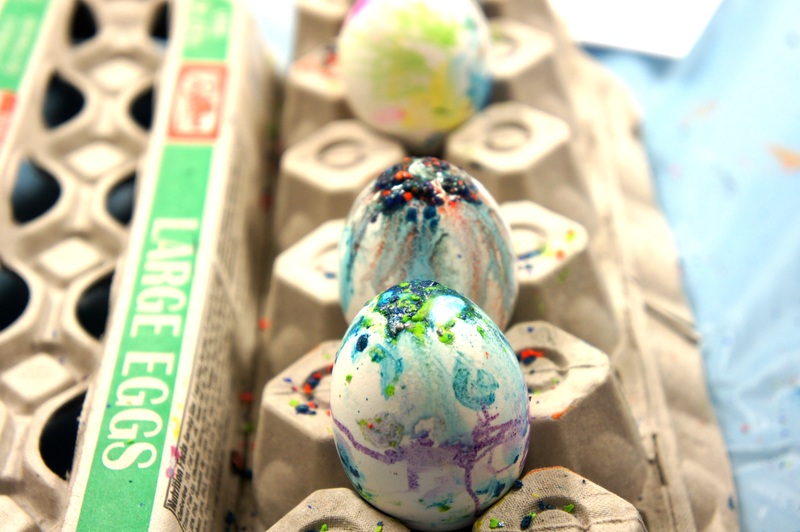 I’ve been wanting to make these eggs for over a year now….I’ve had a slight obsession with melted crayons (see my melted crayon art here and here.) So I was very excited about our melted crayon egg program today! To make them, take hard-boiled eggs that are still hot and sprinkle crayon shavings over them. Then watch the magic as the wax melts and drips over the eggs! I’m recommending that this is best for 3rd-5th graders because of the very hot eggs. You don’t want to send a bunch of little kids home with burned fingers! That being said, you could definitely make this work with an older crowd as well. We do not have a stove at our library, so it took me a while to figure out how to hard-boil the eggs and still have them nice and hot for the program. Place eggs in a single layer in the crock pot. Turn crock pot to low and cook for 3 1/2 hours. I timed it out so that the eggs were finished cooking when the program started. Hard at work grating the crayons. Grating the crayons: I thought the kids would want to grate their own crayons. Bad idea. It ended up being too difficult and I was scared that they were going to slice their fingers off! (We had the band-aids ready.) A staff member ended up grating them all. Grate your crayons ahead of time!!! Warning: Since the eggs need to be HOT for the wax to melt – warn the children not to touch the eggs. I recommend removing them from the crock pot with a slotted spoon, one at a time, and placing them directly on an upside-down egg carton in front of the child. 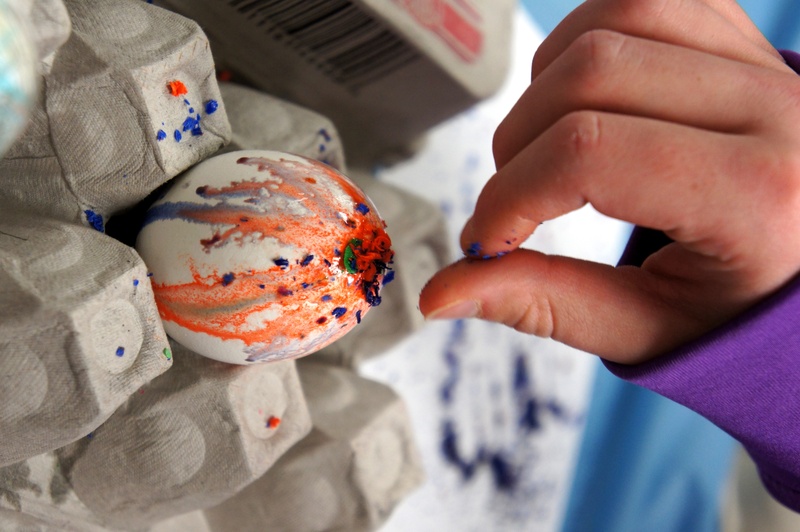 Then kids can sprinkle shavings on the eggs without ever having to touch them. Cover your tables: You don’t want to be scraping dried crayon wax off of your tables for hours. 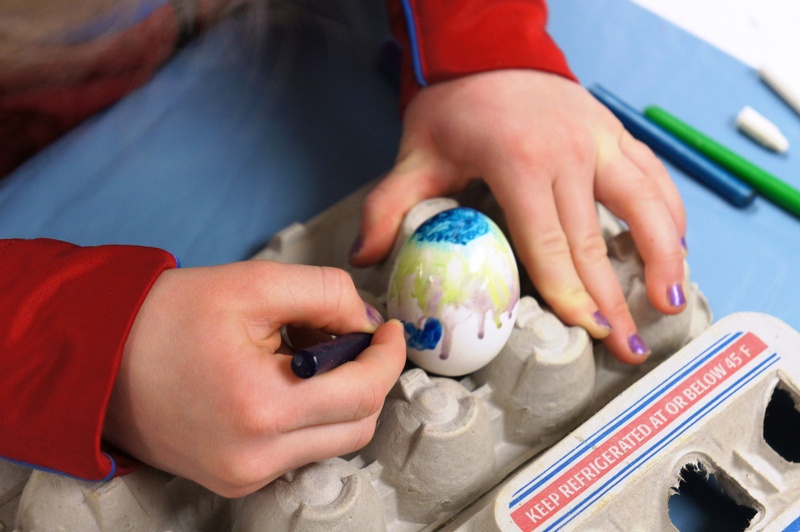 Sprinkling crayons shavings onto an egg. 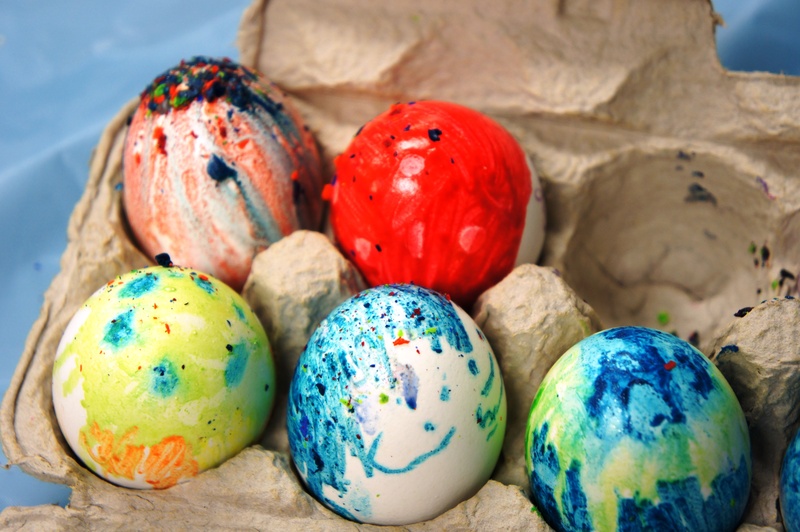 These ended up being just as awesome if you color on the eggs with crayons instead of sprinkling shavings….the effect is just slightly different. I think our group enjoyed both methods equally. Coloring on a hot egg with crayons. 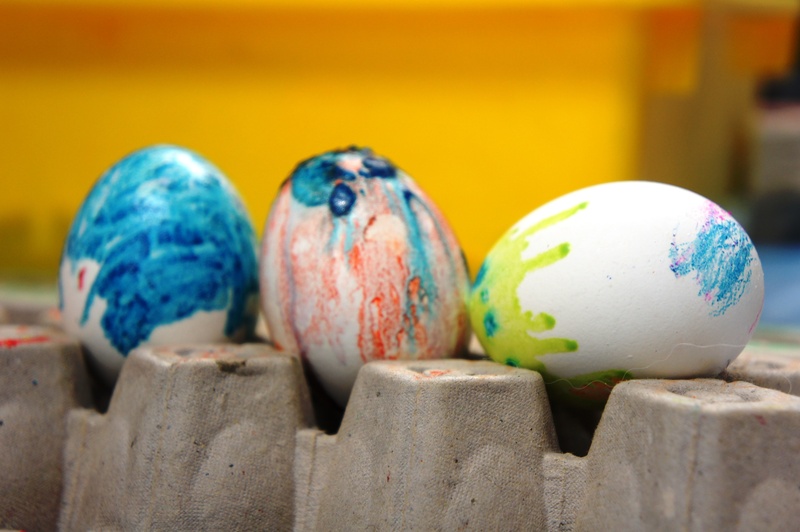 So, forget the dye this year and make yourself some melted crayon eggs for Easter! 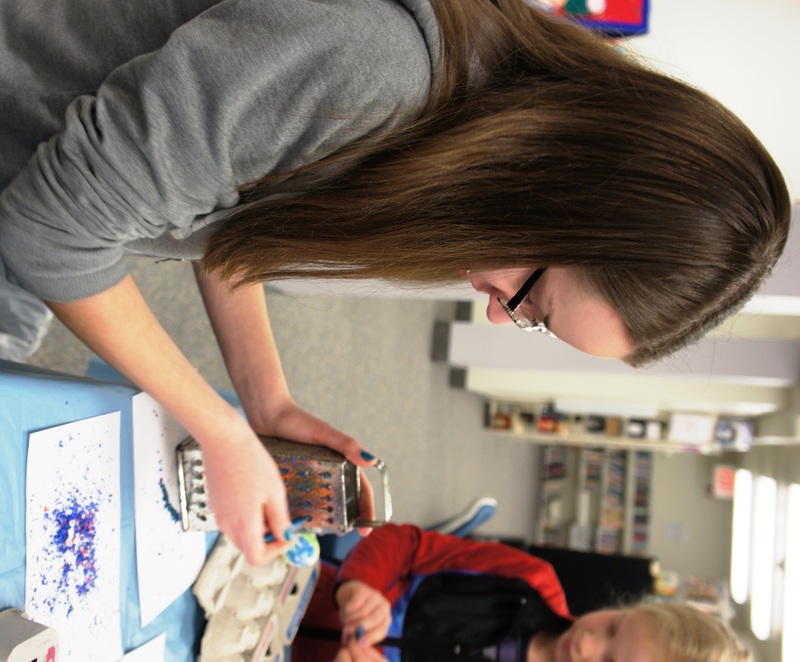 March 20, 2013 in Arts & Crafts, School Age Programs.